The interesting thing about this brine is that it brings a wonderful subtle sweet herbal flavor to the chicken without being overwhelming. Most importantly it plumps the chicken up and creates the most t tender juicy roasted white meat you’ve ever eaten. The oil and salty skin on the chicken is like a sun tan lotion at the beach, letting the skin get crispy and brown on the outside while the inside stays just right! If you’re like me you like your skin blackened to a crisp almost like a potato chip crispy, and you can’t do that unless you brined your chicken without risking over cooked meat and super dry wings. Think of this as a practice run for Thanksgiving when we’ll breakout the big guns for the great big bird, which reminds me, maybe we should think of adding a little Sweet Tea magic to this year’s turkey brine? Let us know what your favorite way to brine and roast a bird is, or prove us wrong and tell us how to get right with the brine! Stay Hungry Y’all! Bring 3 cups of water to boil, once boiling turn the water off and allow tea bags to steep for 5 minutes. After 5 minutes remove tea bags and add salt, sugar, pepper, garlic and rosemary and stir till salt and sugar are dissolved. Allow to cool to room temp before applying to chicken. Brine will work best if chicken is left to soak between 24 -48 hours in a zip lock back in the coldest part of your refrigerator. Preheat your oven to 425 degrees. Stuff the internal cavity of the chicken with the garlic and apples till full, this will cause steam to build inside the chicken keeping it moist and cooking it internally. Then rub the chicken down with the canola oil and apply salt, pepper, thyme and onion powder to help encourage crispy brown skin. Using a meat thermometer cook your chicken till the internal temperature reaches 165 in the thickest part of the breast. During the roasting process you may need to cover the chicken with foil to keep from over browning the skin, or just let it keep going if your like me and like it really black in a few spots. A tip is to pull the bird out when the thermometer reads 158 or so and cover with foil and allow it to carry over cook as it rests. Enjoy your sweet juicy southern bird! This sounds and looks delish. I’ll be trying this! How creative. I love the idea of using sweet tea brine in this dish! This is a must try in our home now. But, I think we might experiment with different teas for the brine to see if we can pull off a little something different. I think I’ll have to try this. I keep plenty of tea in the house, but despite being a Southerner and actually liking real sweet tea, I don’t keep that kind of tea handy. I keep a lot of stuff like ti kuan yin oolong for hot tea, though. I’ve tried to make sweet iced with the fancy leaves I keep and it never comes out right. Do you think using what I have would work for this recipe instead of the tea bags? How many teaspoons would you think would equal to the same? Maybe I should just try the recipe first and experiment later. Great idea. I brine my birds in beer too. a good 2 days in some cases. Ohhhh, this looks so good! If it’s sweet tea, the tea has to be Luzianne-right! 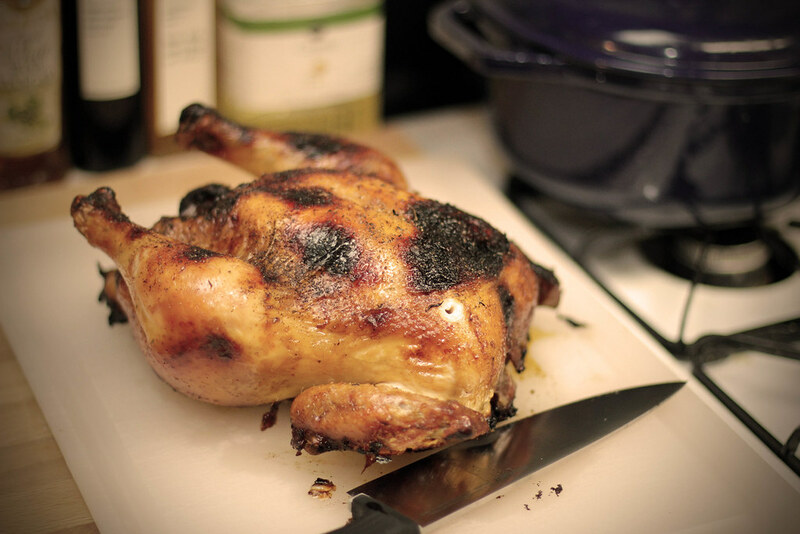 Great looking chicken-I love the apple ingredient in the brine! Sounds good, think I might try this myself. Enjoyed reading the blog.